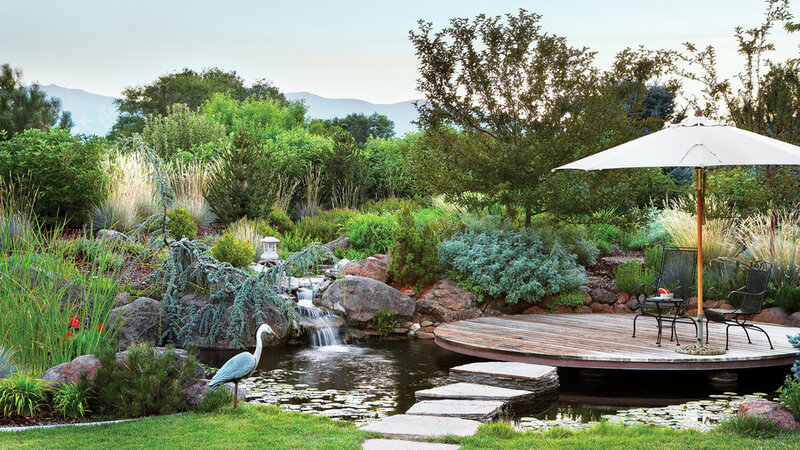 Suspended over a koi pond, a circular redwood deck in Gardnerville, NV, is both a viewing platform and shade structure for fish. The nine piers of steel-reinforced concrete that support it were poured in place as an integral part of the pond bottom, as were the steps that appear to float across the water’s surface. Both the steps and piers were finished below the waterline with rough-textured black plaster. 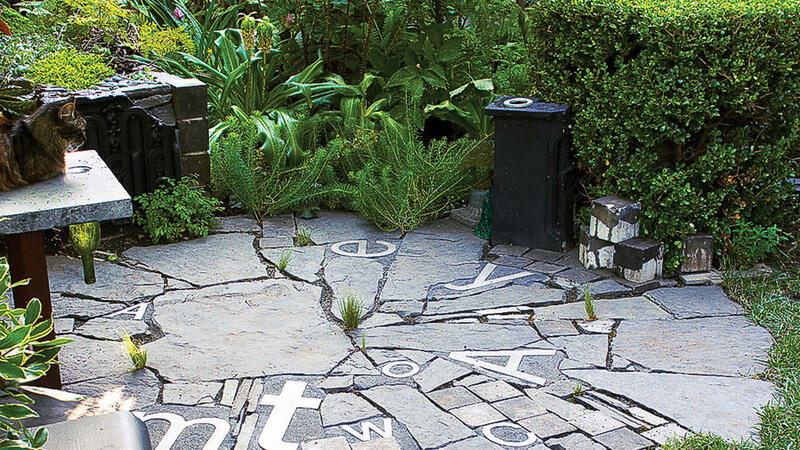 Large and small aluminum letters, set between irregular chunks of black slate, gives this 8-foot-wide patio in Alameda, California, contemporary flavor. 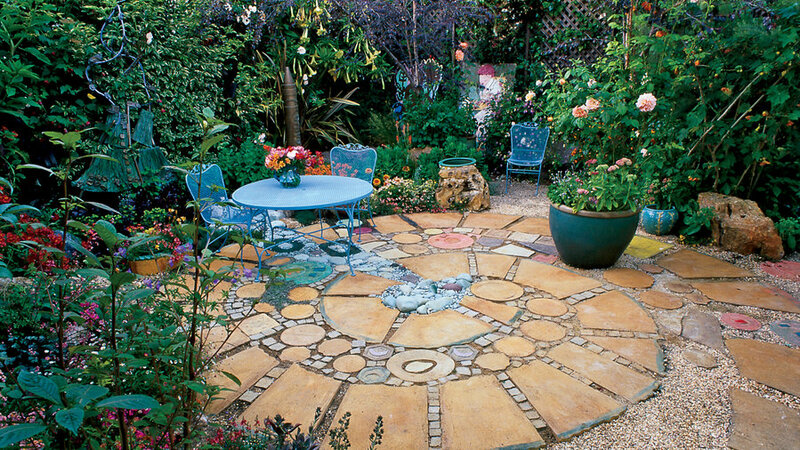 Colored stones, surrounded by pavers of stained concrete, create the illusion of a stream bubbling through the center of this 12-foot patio in Berkeley. 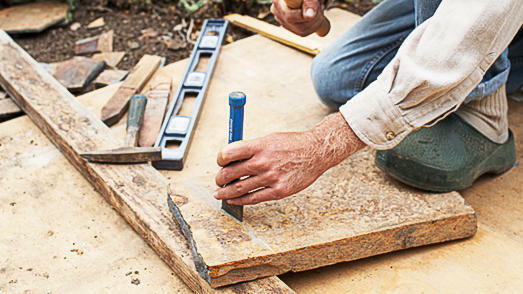 Shopping tip Look for 1- to 2-in.-thick stone (it’s easier to cut) in 1- to 3-ft.-long pieces, and choose as many straight-sided pieces as possible. Buy 30 percent more than you think you’ll need. The quantities below are for our 8-ft.-diameter patio. Choose a level site, then rake soil smooth. 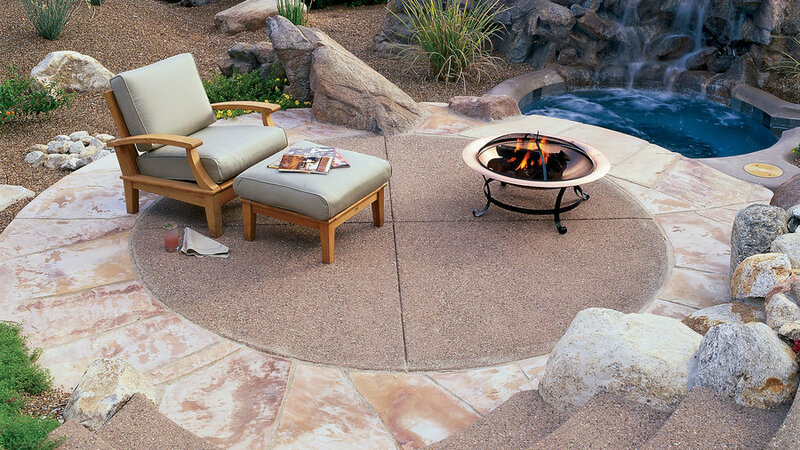 Place a stake in soil to mark the patio’s center. Cut a piece of string about 6 ft. long; tie to the bottom of the center stake, measure out 4 ft., and tie free end to the second stake. 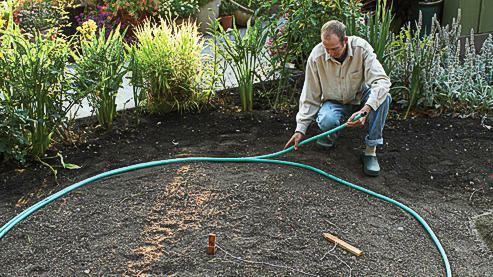 With that free stake, pull the string taut and trace the patio’s outline in the soil as you walk around the center stake. 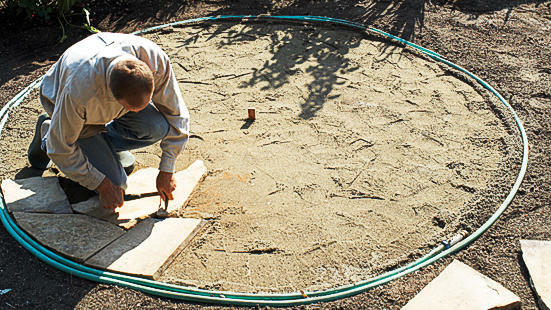 Remove stakes, then mark the circle with a hose. Using shovel, remove 3 in. depth of soil from the entire circle. Tape the level to the narrow side of the 2-by-4; use the board to level the surface. Fill circle with 2 to 3 in. of sand, rake smooth, then recheck the overall level. Moisten sand with water, then tamp it firmly. Level again. 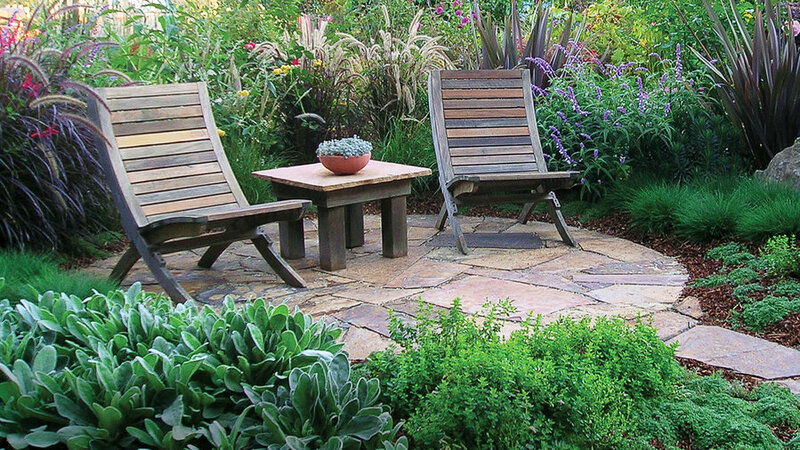 Starting at the outer edge, position the large stones to sit slightly above the surrounding soil surface. Arrange as carefully as possible for fit; place as many large pieces as possible, then fill in with smaller pieces. Check the level of the patio regularly. Use a chisel and mallet to break stones into smaller pieces (wear goggles). Place a stone atop a board, scrape a line on stone where you want to make cut, gently strike the chisel there to make a ⅛-in.-deep depression, then pound the stone hard until it breaks. 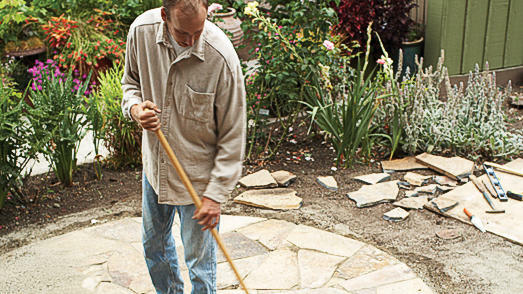 Shovel sand over patio and sweep it into cracks; spray with water to settle. Apply more sand; sweep again. 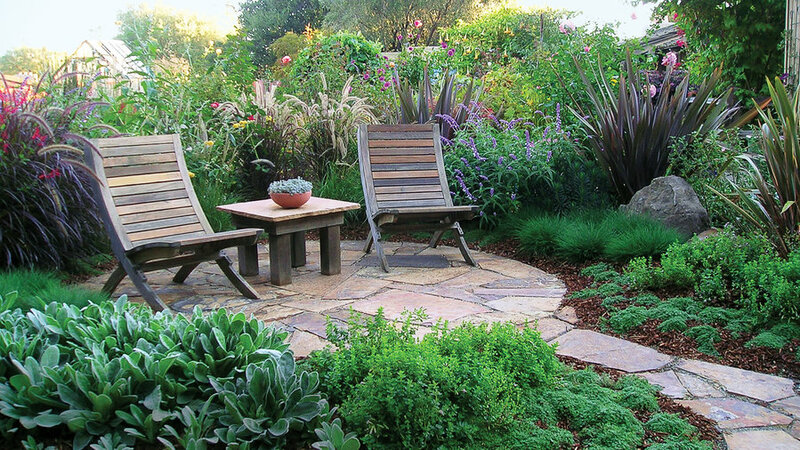 Surround your new patio with your favorite plants, or use our planting plan. 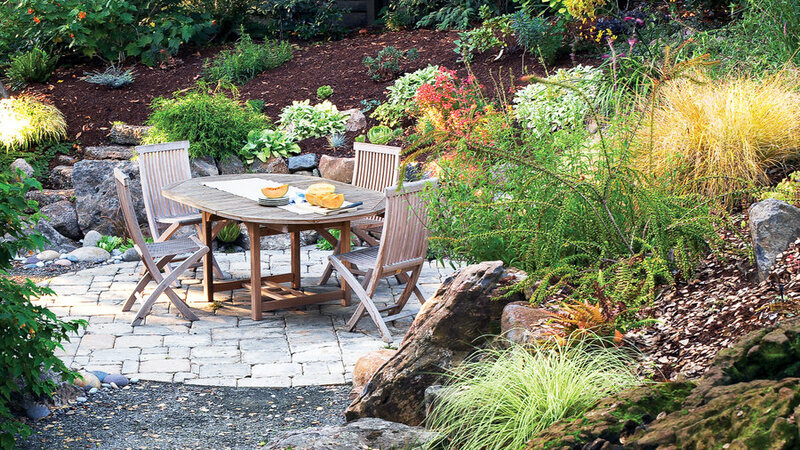 Add chairs and a table for your wine or coffee, and enjoy your new outdoor room.